In this, the 121st episode of CS, we return to our narrative timeline for church history. Before the 10-episode The Change series, we left off with the Reformation in Europe as it interfaced with the Rationalism of the Renaissance in what’s called Protestant Scholasticism. Let me be clear; there’s much that took place in Europe during the Reformation we skipped over because it would have gotten us into the proverbial weeds of details that while a few might find interesting, most would regard as that which makes some accounts of history so laborious; that is, a lot of names & dates. In this episode, I want to step back and do something of a review to set the Reformation in perspective. Although it surely would have grieved him had he lived to see it, Luther’s legacy in the years after his death was over a Century of religious wars. These wars didn’t just pit Catholics against Protestants, Protestant factions went to war against each other. If the Reformers had hoped to purify the Church of both theological error & political corruption, they may have succeeded in the first endeavor but failed miserably in the second. It seems people who want to use religion for personal ends don’t really care what face the mask bears, just so long as it gets the job done. Some of the more devastating wars included the French wars of religion, the Dutch revolt against Philip II of Spain, the attempted invasion of England by the Spanish Armada in 1588, the 30 Years War in Germany, and the Puritan revolution in England. The 17th C was a time of theological & political entrenchment. European Christendom was now divided into 4 groups: Roman Catholic, Lutheran, Reformed, & the Anabaptists. The first 3 became officially associated with regions and their governments, while the Anabaptists, after their disastrous failure at Munster, learned their lesson and sought to live out their faith independently of entanglements with the civil authority. During the 17th C, Catholics, Lutherans, and Reformed developed impenetrable confessional bulwarks against each other. As we saw in a previous episode, Catholic orthodoxy achieved its definitive shape with the Council of Trent in the mid-16th C. The Jesuits played a major role at Trent, especially in the answering the challenge presented by Luther’s view on justification and grace. The council affirmed the importance of the sacraments, and the Roman church’s theological position on the Eucharist. At Trent, the Jesuits affirmed the importance Thomism, that is, the work of Thomas Aquinas in setting doctrine. The triumph of Thomism at Trent set the future trajectory of Catholic theology. In episode 110, we mentioned the rise of Protestant Scholasticism in post-reformation Europe. It seems there’s some confusion regarding the difference between Protestant orthodoxy and Protestant scholasticism. Orthodoxy is concerned with correct theological content, while Scholasticism had more to do with methodology. From the mid-16th thru 17 C, Protestant orthodoxy clarified, codified, and defended the work of the early Reformers. Then, after the careers of the next generation of Reformers, it’s convenient to identify 3 phases of Protestant orthodoxy. “Early orthodoxy” runs from the mid-16th to mid-17th C. It was a time when Lutheran and Reformed groups developed their Confessions. “High orthodoxy” goes from the mid- to late 17th C. This was a time of conflict when the Confessions hammered out earlier were used as a test of orthodoxy and formed battle lines to fight over. “Late orthodoxy” covers the 18th C, when the people of Europe began to ask why, if the Protestant confessions were true, rather than leading to the Peace the Gospel promised, they lead instead to war, death, & widespread misery. Actually people had been asking that question for a lot longer than that; ever since the Church and State had become pals way back in the 4th C. But it wasn’t till the 18th C that they felt the freedom to voice their concerns publicly without the certainty they’d be set on by the authorities. As Protestants & Catholics identified their differing theological positions, they became increasingly mindful of their methodology in refining their Confessions. Each appealed to the intellectual high ground, claiming a superior method for defining terms & reasoning. This was the age when there was a return by Christians theologians to Aristotelian logic. Once the Council of Trent concluded and the Roman Church fixed its position, the opportunity for theological dialogue between Protestants & Catholics went dissolved. After that it was simply up to the various major groups to fine tune their Confessions, then fire salvos at any and everyone who differed. It was the Era of Polemics; of diatribes and discourses disparaging those who dared to disagree. In a previous episode we dealt with the career of Jacob Hermanzoon; AKA Jacobus Arminius. Arminius rejected the Calvinism promulgated by Calvin’s student Theodore Beza. Arminius’ followers developed what they called the Remonstrance, a 5-part summary of what they understood Arminius’ positions to be on key issues of Reformed Theology. A theological and, wouldn’t you just know it, political controversy ensued that was addressed at the Synod of Dort. The Synod declared Arminius a heretic, the Remonstrance errant, and the 5-Petals of the Calvinist Tulip were framed in response to the 5-points of the Remonstrance. A few Arminianist leaders were either executed or jailed while some 200 pastors were removed and replaced with properly Reformed ministers. Despite this, the Arminianist position held on and continued to hold sway over the conscience of many. A couple decades after the Synod of Dort, another controversy surfaced among the Reformed churches of France. It centered on the work of the brilliant theologian Moses Amyraut, professor at the then famous School of Samur. Amyraut took issue with one of the articles of the Canons of Dort, that is, the doctrine of limited atonement. He argued for unlimited atonement, believing that Christ’s atonement was sufficient for all humanity, but efficient only for the elect. His view is sometimes known as “Hypothetical Universalism” far more commonly as 4-point Calvinism. In A Short Treatise on Predestination published in 1634, Amyraut proposed that God fore-ordained a universal salvation through the sacrifice of Christ for all. That salvation wouldn’t be effectual unless appropriated by personal faith. Amyraut’s modification of Calvinism came to be labeled as Amyraldism & led to recurring charges of heresy. Amyraut was exonerated, yet opposition endured in any of the churches of France, Holland, and Switzerland. The Council of Trent didn’t completely quash theological reform among Catholics. In one of the more remarkable theological developments of the 17th C, a splinter of Calvinism stuck in Rome itself. While studying theology at the Catholic University of Leuven, Cornelius Jansen and his long-time friend, Jean Du Vergier, developed a deep interest in the thought of Augustine of Hippo. Both men went on to important positions later in life. Du Vergier became abbot at the monastery of Saint-Cyran, and Jansen was bishop of Ypres. Jansen died suddenly during an epidemic in 1638, but before his death, he committed a manuscript to his chaplain; it was his magnum opus on Augustine’s theology. Published in 1640 under the title Augustinus, Jansen took a strict Augustinian stance on things like original sin, human depravity, and the necessity of divine grace. Jansen echoed Augustine’s ideas on predestination & argued God predestined only certain people for salvation, leaving the rest for condemnation. In 1653, Pope Innocent X issued a papal bull condemning Jansen’s work. Because Du Vergier was now deceased, Arnauld led the Jansenist. The famed Blaise Pascal took up his pen in defense of Arnauld in his famous Provincial Letters. But neither were able to turn the tide, and Jansenism was systematically dismantled. The convent of Port Royal was prohibited from receiving the sacraments and forbidden to accept new novices. Finally, in 1708 the pope issued a bull dissolving Port-Royal-des-Champs. The remaining nuns were forcibly removed in 1709, and most of the buildings were razed in 1710. Sadly, after Luther’s death, the movement that bore his name fell into disarray and in-fighting. Lutherans broke into 2 main camps. Those who claimed to stay strictly loyal to Martin, and those who followed his main assistant Philip Melancthon. They remained at something of a theological stalemate until the Formula of Concord in 1577, which became the definitive statement of Lutheran orthodoxy. Much of the destruction of the 30 Years War took place on German soil. Agriculture collapsed, famine reigned, & universities closed. By the end the war, there were at least 8 million fewer people in Germany. The Peace of Westphalia made room for Catholics, Lutherans, & Calvinists, depending on the religious leaning of the ruler. Weary of bloodshed, the 3 communions withdrew behind polemical firewalls and, instead of firing cannonballs, lobbed theological bombs at the each other. That word Pietism has sadly seen a lot of emotional baggage and negative connotation for many today. They understand Pietists as wanting to privatize their faith, to withdraw from the public square and divorce their faith from the wider world. To use Jesus’ term, they see pietism as an attempt to hide you light under a basket, to put the city, not just in a valley, but in a cave, and to shot the mouth with a rock. While some Pietists did privatize their faith, that isn’t really the goal of Pietism. Pietism was a movement that simply sought to keep piety, that is, the practice of godliness, in the Christian life. It was understood that this godliness wasn’t the result of rules and regulations but of a genuine relationship with God. Pietism was a reaction to the dead orthodoxy of confessional, State Lutheranism of the early 17th C.
Now, this is not to say that scholastic theologians were all lifeless profs. Some of them also produced moving hymns and stirring devotional writings. Philipp Jakob Spener is known as the “father of German Pietism.” Born at Rappoltsweiler in 1635, Spener was raised by his godmother & her chaplain, Joachim Stoll who became Spener’s mentor. Stoll introduced him to writings of the English Puritans. Spener went on to study theology at Strasbourg, where his primary professor was Johann Dannhauer, one of the leading Lutheran theologians of 17th C. Dannhauer deeply inspired the young Spener. When he entered his first pastorate in Frankfurt in 1666, Spener was convinced of the necessity of a reformation within Lutheranism. His sermons emphasized the necessity for a lively faith and holiness in daily life. His most significant innovation was the establishment in 1670 of what today wed’ call a small or home group.These were gatherings of small groups of church members in homes to discuss sermons, devotional reading, and mutual edification. In 1675, Spener was asked to write a preface for a collection of sermons by Johann Arndt. The result was the famous Pia Desideria (= Pious Wishes), which became a kind of Introduction to German Pietism. While this is a bit more detailed than our usual fare here on CS, I thought it might be interesting for some of our subscribers to hear the main points Spener made in the Pious Wishes. He enumerate 6 things as important for the Church to embrace. . .
1) He called for “a more extensive use of the Word of God.” To that end, Spener advocated small groups to encourage greater study of the Bible. (2) He urged a renewed focus on the role of the laity in Christian ministry. (3) He placed an emphasis on the connection between doctrine & living. 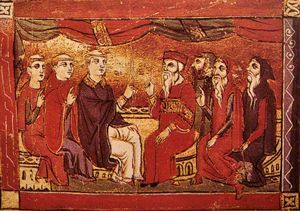 (4) He counseled restraint and charity in theological disputes. (5) He urged reform in the education of ministers. They must be trained in piety and devotion as well as in academics. (6) He said preaching ought to edify & be understandable by common folk, rather than sermons being technical discourses only an educated few or could understand. Spener’s Pia Desideria won him many followers, but aroused strong opposition among Lutheran theologians & not a few pastors. Despite criticism, the movement rapidly increased. Pietism had the good fortune of seeing Spener succeeded by August Francke. Francke was born in Lübeck & graduated from the University of Leipzig, where he excelled in biblical languages. While a student at Leipzig in 1687, he experienced a dramatic, that is emotionally charged, conversion, which he described as the “great change.” Francke’s conversion became something of a model for Pietism. In order for conversion to be considered legit, it needed to be preceded by a profound conviction of sin that’s a datable event to which one can point for confirmation. By this time, Francke had become closely associated with Spener. It was due to Spener’s influence Francke was appointed to the chair of Greek and Oriental languages at the new University of Halle. Francke emerged as the natural successor to Spener. From his position at Halle he exercised enormous influence in preparing a generation of Pietist pastors and missionaries all over the world. Under his guidance the university showed what Pietism could mean when put into practice. In rapid succession Francke opened a school for poor children, an orphanage, a home for indigent widows, an institute for the training of teachers, a medical clinic, a home for street beggars, a publishing house for Christian literature, and the famous Paedagogium, a preparatory school for upper-class students. For 36 years his energetic endeavors established Halle as the center of German Pietism. Together, Spener and Francke created a true Ecclesiola in ecclesia. Spener and Francke inspired other groups of Pietism. Count Nikolas von Zinzendorf, was Spener’s godson and Francke’s pupil. Zinzendorf organized refugees from Moravia on his estate and later shepherded them in reviving the Bohemian Unity of the Brethren. The Moravians carried their concern for personal piety literally around the world. This was of huge significance for English Christianity when John Wesley found himself in their company during his voyage to Georgia in 1735. What he witnessed in their behavior and heard in their faith after returning to England led to his own spiritual awakening. Yes, Lance, I caught all those strategically placed “d’s”. Clever.